Water balloon fights were an infrequent but extremely fun summertime activity. The surprise attack hit to the back of the neck was my favorite technique. This would dump water down the inside of the other person’s shirt leaving them temporarily stunned and vulnerable to additional direct hits. It was always hilarious when someone would get hit at just the right angle where the balloon doesn’t break. Picking up a bounced balloon and hitting the original owner with it was always very satisfying. Ouch, good thing the eyebrows weren’t harmed. I don’t often feel sorry for Biff, but this is one of those exceptions. that is a grate idea from biff but crriot juce wuld hert less. i had some friends growing up who would fill normal sized balloons with water. those were fun. Wait, what? With no salt? I would always stick some ice cubes in my water balloons foe either super cold stunning effects, or the chance that the ice would cause pain, I’m a bit of a jerk. hmm… my only use for lemon juice is with fish&chips. I drown the fish (!) in lemon juice. the problem is that I can’t taste the fish anymore :(. My favourite water balloon memory is one I half filled with water. I hit it with a pickaxe, which gouged a 5cm (about 2 inch?) hole in the ground. It didn’t pop. I tried every conventional thing a boy of 10 could. still nothing. You had access to a pickaxe at the age of 10? As hot as it gets around here in the summer, water balloon fights were surprisingly rare for us. I remember the balloons mostly not popping when they hit somebody; perhaps that is why we usually passed on the water balloon fights. Otherwise, it just took too much preparation to bother having a full-scale water balloon fight. When I was 10 me and my cousin were dropping balloons from my granpa’s balcony and trying to hit the chickens.Then a lady passed by and I (being the mischeveos one) threw a balloon at her.She started yelling for us to go get our parents.Luckily nobody was home so we didnt get grounded.We just hid in the living room until the crazy lady disapeard. One thing I always enjoy about Biff is the perspective. You know there must be other people, because he interacts with them. He has friends, but we never see them, just Biff. I like how it leaves Biff’s world to the imagination. Do his friends have crazy eyebrows, too? @BillyJoeBob; The eyebrows may not’ve been harmed, but they might bleach out… Biff with blonde brows! Eck. I’m rather surprised Biff didn’t load up with onion juice. I’d tell y’all how to make armor-piercing waterballoons, but my father already regrets telling *me*… I won’t proliferate the menace. Too bad, y’all – They’re awesome! Another fine, dastardly product from the diseased minds of CalTech! Oh why, Biff, why? Haven’t you learnt that citric fruit juices and eyes don’t mix? How many more times must you clutch at your eyes? Oh man does that have to sting!!! ….cool! I wanna try that game! I’ve managed to get rubbing alcohol and pepper spray in my eyes, so lemon juice doesn’t sound all that bad. @MaskedMan: Do you perhaps mean adding a drop of soap so the water wets better? I, for one, think Biff needs to have some brow-bleaching accident. So, I was at a church youth event that involved baloons of water as well as other watery weaponry. Near the beginning one girl, I’ll call her Jenny, was a bit away from me, and she went to pick something up. I took the chance to lob a water baloon in a perfect arc that flew gracefully into the air then dove down like a kamakazi right onto the back of her neck. That happened just a few moments before someone told be, a bit too late, that for some reason she wasn’t supposed to get wet. Too late! Ah, but it gets better. I said this was about revenge! Butm if it great, that means she got me back, right? Not quite. Near the end, after whe had fully dried off, I was forced to stand against the wall (not physically forced, I decided to cooperate, we was all nice people) while she got the chance to hit me with a baloon. Now, of course, a simple splash back would simply be justice, but not revenge, so she made a massive baloon, bulging with water. She hefted it up to hurl at me, and it popped in her hands, and again, she was soaking wet. Maybe I laughed a bit too maliciously at her misfortune, but it was funny as heck! and licking the lemonade off afterwards. @J.R.; Nice technique, but no… I’m talking waterballoons that can strip the paint off of concrete at the point of impact, solely *from* the impact. One of the Halls at CalTech was using 1/2″ plexi to armor their windows so they could fire-hose the Quad with impunity. A friend of my father’s, from his Hall, figured out how to shatter the plexi shields using waterballoons. Actually fairly dangerous stuff, and shockingly simple. I’ve built them myself, and smashed a hole in the (wood) siding of the house. No, there was no ice involved. Nor rocks. Aside from the ridiculous stinging of the eyes, and the stickiness afterwards, I imagine that WOULD be very refreshing. make the jump AND be able to land on the track perfectly is just awesume. Water balloon fights never really worked for us for some reason. The Balloon would always just bounce off of us, fall to the ground and pop. . . Perhaps we should’ve bought thinner balloons. . .
I’ve actually done that with my friends, it burns so much! Just because the nice ladys in the comercial did it, it didn’t mean it was real. 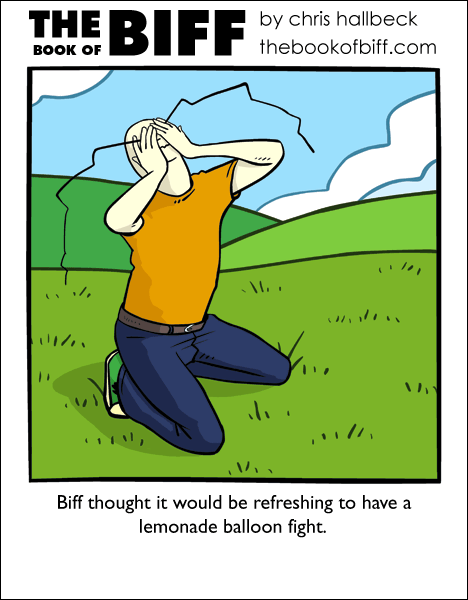 How many times must Biff clutch his eyes before he remembered the encounters with citrus juices in the past? @Morzikei Sorry everyone for replying to his outburst a bit late. And yes, I had access to a pickaxe at the age of 10. it was one of those thing just lying around outside, being made of bronze. the real danger in it wasn’t the head flying off like most, but it falling down. If it did that, it hurt your hands when it hit. then you reflexively drop it. Bad. Thankfully, centrifugal force existed and I was saved. Sorry, no blood and gore. This is what you must play before joining the sodium hydroxide-balloon tournaments. It may just be my sadistic side, but I to enjoy seeing biff in pain. x.x my eyes they hurt just thinking about….something i must try though. and i have been hearing alot about the armor-piercing water balloons. im very curious on how they work. Now we all know why Biff lets his eyes rest in a jar. The ultimate water ballon of revenge is made out of rotten milk, urine, ice, a touch of lemon juice, and barf(Make sure you bring a a toy that matches the persons gender.) . If the person really ticked you of, add your barf to it. Now instructions:1st:Ring the doorbell (if the person lives with his/her parents, ask for her/him.). 2nd: Now give the person the present. As they stare in awe, wait till they say “Thank-You!!”. 3rd: After they say “Thank-You! !” throw the horrible, disgusting, ultimate revenge water balloon and run away as fast as you can!!! THE END! God, I remember once, I bought a pack of water balloons, the more expensive ones that have tonnes of good-quality ballons, not the break-when-filled kind. Anyway, whenever we threw them, then NEVER BROKE. This one made me laugh out loud.